The architect is no longer an organizer of matter and space, but a designer of systems with multi-layered components and complex relationships. [En]Coding Architecture 2013 brings together rising superstars, experienced researchers and designers to present experimental work derived through computational thinking and digital making. [En]Coding Architecture 2013 positions the field of architecture as an alloy of programming, digital tooling, art and science. The conference synthesizes new trajectories for the profession in a cybernetic context of tectonics, cultural philosophy, architectural theory and geopolitics. Undeniably, there is a global desire to re-discuss architecture now. 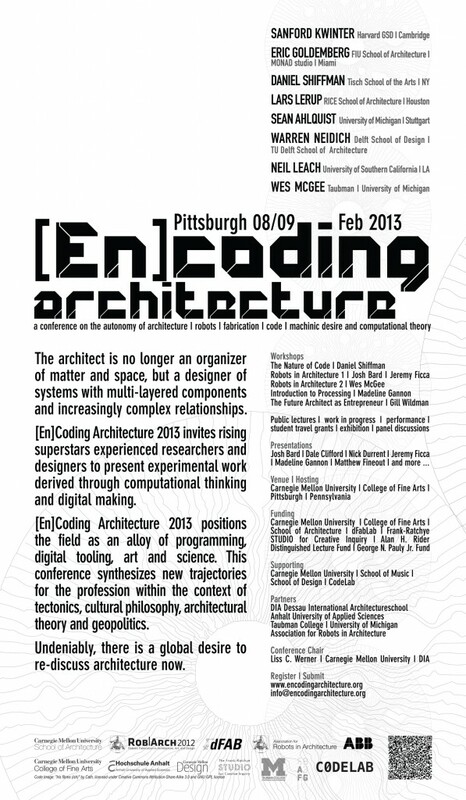 Come and join the discussions for the evolution of architecture…. News:: Due to severe weather in the NY area, Inge Rocker, Andreas Trummer and Daniel Shiffman will not be able to come. Daniel’s workshop will take place. Lars Lerup lecture is cancelled due to illness. We do apologize. registration for conference and workshops is open…..
call for projects is closed now……………………..
registration is necessary please register here………..